Watch My Garden Grow: Snow! I am glad I took the green tomatoes off the vine on Friday! 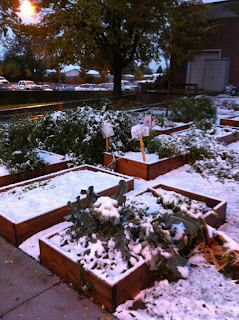 We had our first snow in the garden yesterday morning. Clint took the picture----I was busy at meetings in the morning. The west side received the snow---no snow on my grass yet!